As empty-nesters last year for the first time, Jim (DH) and I decided to hit the road and head to our favorite city, Montreal. No staring across an empty table with just a big bird between us two...we wanted a distraction. This year, again, Steph is with her sweet boyfriend Kevin, and his family. We are happy that she has found someone so wonderful and his family likes her! Son Craig is still at school at Cal State, which doesn't allow him to join us. This year, the holiday details repeated themselves, so once again we headed north. Our second day in the city started out gloriously...a discrete knock at our door and a silver service was waiting for us. The white linen covered cart held coffee, toasted bagels, and cream cheese for DH and tea, croissants, & jam for me. We sat at the table in front of the large windows and planned our day. First stop: The Titanic Exhibit... My talented friend Kate Messner clued us in on the recently opened exhibit on the 5th floor of Centre Eaton. THANKS! After paying the admission fee ($18.45 adult weekday), a photographer takes your picture and a polite employee gives you a boarding pass. The ticket has the name and brief biography of a person who traveled on the Titanic. At the end, he told us, we would discover if we had lived or perished in the sinking. My person: Mrs. Sylvia Caldwell, a woman traveling second class with her husband and ten month son. Jim's: Mr. Claus Peter Hansen, a third class passenger traveling with his wife and brother. Our prediction? I survived and he, as a man and in third class, died. The exhibit was MAGNIFICENT! We spent almost two hours (but it can be done in less time, as those who passed us by could attest) viewing the poignant displays. 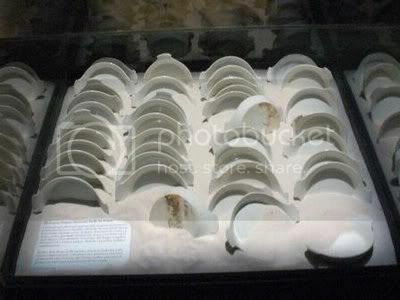 Actual artifacts brought up from the floor of the ocean recovered from the Titanic were the centerpieces of the displays. Additionally, there were large portraits of regular families and rich and famous, along with each of their stories. 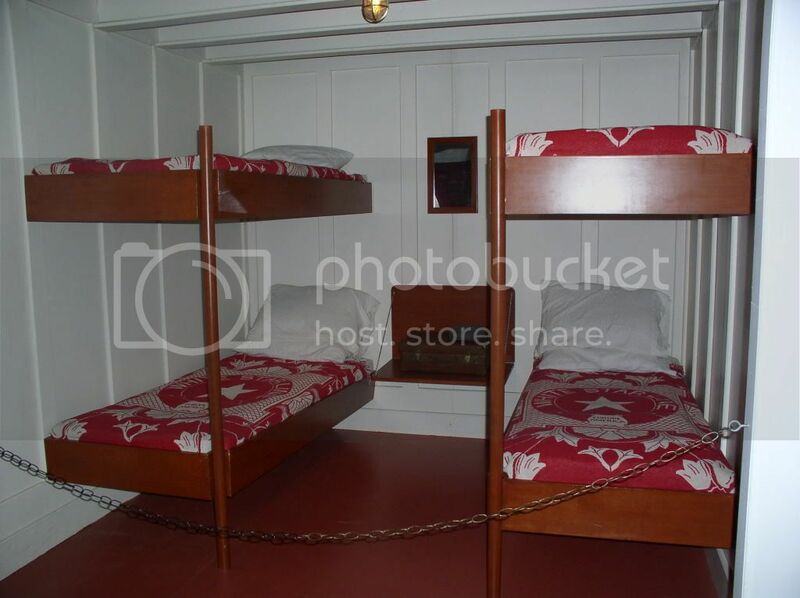 Additionally, the traveling museum displayed historically accurate recreations of staterooms and third class accommodations. There were exhibits that children would find interesting: a glacier you can touch, perfume recovered from the ocean floor that you can smell, a to scale model of the ship, and a computer generated video of the sinking. We were moved by the experience and thought the entire presentation was well done. If you ever have the opportunity to see this exhibit, I strongly urge you to go. The cost was worth it. You are probably wondering...yes, I lived, as did my husband and ten-month old. DH wasn't so fortunate. His ticket purchaser perished along with his brother. His wife survived. Particularly haunting was the list of survivors and those who died. As a person's fortune decreased (according to class traveled) his chances of survival also decreased. LATER THAT DAY....After some quick shopping at my favorite Montreal store, Winners, DH and I went back to the hotel and took a nap. So far, it didn't seem like Thanksgiving. For dinner, we decided to make it a really special evening and go to the Maison du Jazz (House of Jazz). We had been there before with Steph & Kevin, so we knew we would have fun. The food was good (but don't go there for the menu) and the music was great. The band featured a guest trumpet player. That's when I started to feel sad about my family....my father played the trumpet, as did my brothers. I thought of us all scattered from one coast of the US to another...and longed for the days when we were together. I didn't let my feelings consume me, though, instead I focused on the thanks part of the holiday. Here's my Thank You list: Thanks that my brother Matt and his wife Lori were with my Mom. It was the first time she'd seen him since he returned home from Afghanistan. Thanks that Craig was invited to be with the West Coast Collins'...he was so looking forward to finally seeing his two cousins again since last year...Thanks that Stephanie has such a wonderful boyfriend and that Kevin's family cares enough to include her...Thanks that Jim and I are financially able to go to Montreal in this economic downturn....Thanks that my children got to know my dad so well before he passed away....Thanks for my dear, dear friends back in Plattsburgh. We are truly fortunate people!